ArcView was used to quickly create bathy- metric data, perform editing, and create cartographic output. ArcPad's simple API saved time. GIS helps to accurately apply herbicide to targeted areas. Saratoga Lake is a 4,000-acre lake located in Saratoga County, New York. 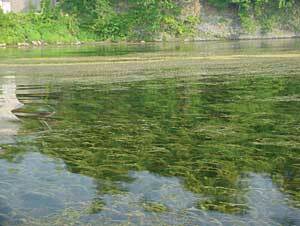 The highly invasive Eurasian watermilfoil weed was reportedly introduced to Saratoga Lake in the mid-1970s and reached nuisance densities by the early 1980s. Planning efforts began in 1982, and in 1986 a mechanical harvesting program was initiated to cut and remove the weed from the lake. The Saratoga Lake Protection and Improvement District (SLPID) was created in 1986 to oversee the harvesting operations. Harvesters were operated between mid-May and mid-September each year. While simultaneous watershed management efforts improved water quality, the Eurasian watermilfoil infestation became worse. By the mid-1990s, most of the lake perimeter less than 15 feet deep supported dense Eurasian watermilfoil that would grow to the surface and greatly interfere with recreational boating and swimming, not to mention adversely impact fish, wildlife, and water quality. The harvesting program simply could not keep up with the proliferating plant. This map illustrates the presurvey bathymetry data that was collected in 1980 and the new depth measurement points. 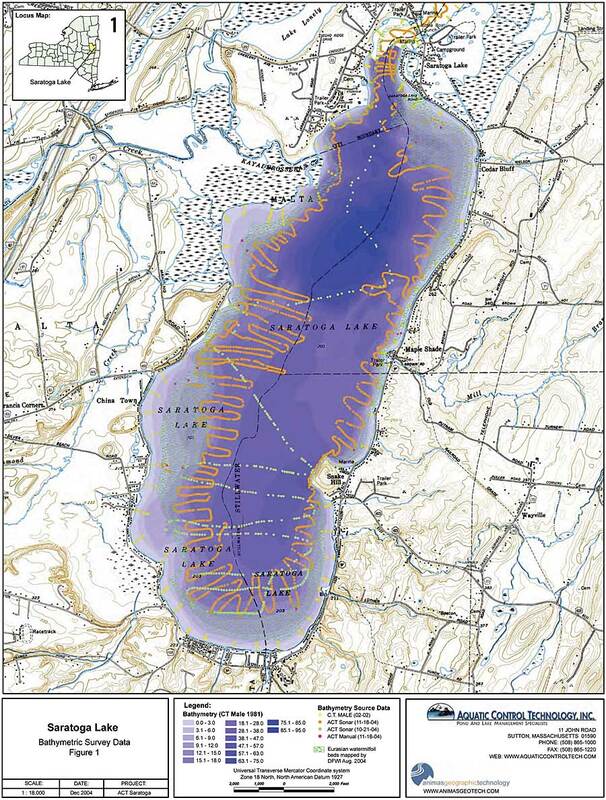 This map shows the new postsurvey 2004 bathymetry data along with the occurrence of Eurasian watermilfoil in the lake. SLPID prepared a comprehensive watershed management plan in the late 1990s. One recommendation was to conduct demonstration herbicide treatments to evaluate their efficacy as compared to the ongoing mechanical harvesting program. Aquatic Control Technology, Inc., an applied lake management company, was selected through a competitive procurement process to perform the demonstration herbicide treatment in 2000. Aquatic Control Technology was primarily selected for its technical approach, which included the use of real-time differential GPS navigation of the treatment boat. An ArcView and GPS interface created by Colorado-based Esri Business Partner Animas Geographic Technology was successfully used for the treatment. 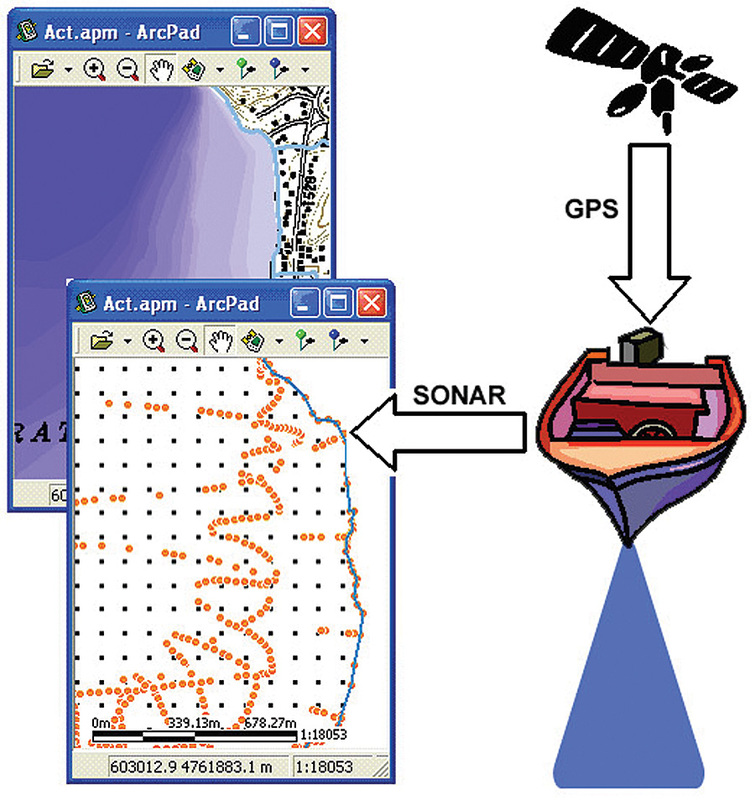 SONAR and GPS data flows into an ArcPad point feature shapefile that was then used to develop the updated bathymetry data. 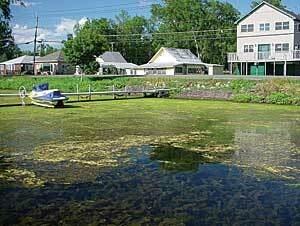 Following a second demonstration treatment in 2003, Aquatic Control Technology was contracted to develop a long-term aquatic plant management plan for Saratoga Lake in 2004. Aquatic Control Technology realized it needed a better way to perform pretreatment survey activities and the treatment itself. The company also needed a way to produce accurate calculations of lake volumes at various depth thresholds to plan for the best treatment methodology. This was a challenge, because existing bathymetry data dated back to 1980 and no new depth survey work had been performed. Bathymetry is the underwater equivalent of topography and a bathymetric survey is akin to a topographic survey of the floor of a body of water. Aquatic Control Technology also needed a way to accurately navigate multiple treatment crafts in real time. 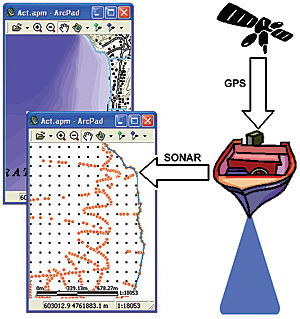 Animas Geographic Technology worked with Aquatic Control Technology to create a real-time data collection application that combined differential GPS input with sonar. Animas Geographic Technology selected ArcPad to provide Aquatic Control Technology with a lightweight and flexible data collection/navigation application. 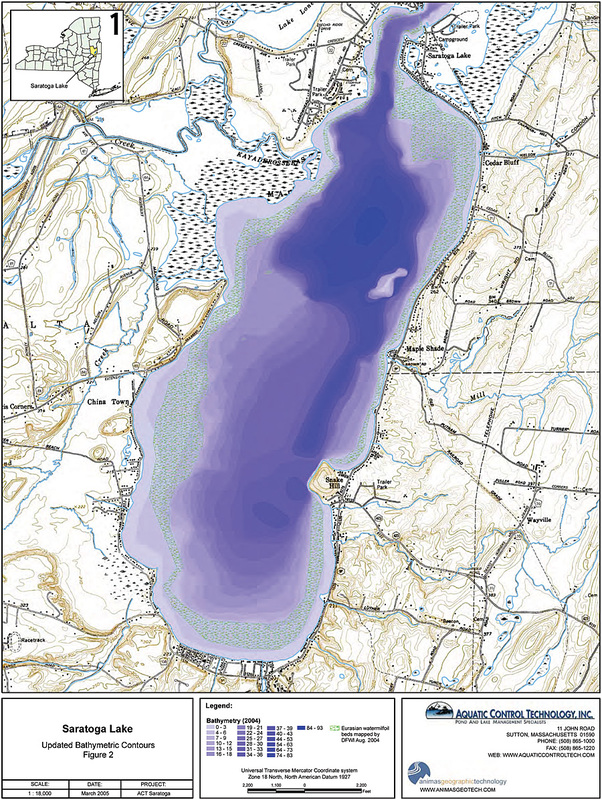 Using the application, Aquatic Control Technology was able to efficiently collect enough data to create new bathymetry data for the entire lake bed. ArcPad was selected for the simple and flexible application development interface it provided. ArcPad saved time and allowed Animas Geographic Technology to focus on data collection workflows and integrating the sonar and GPS equipment. ArcPad also offered a platform that would run on both Windows XP and Windows CE, which was important to Aquatic Control Technology since it had invested in both handheld and laptop field computers. Saratoga Lake has experienced a Eurasian watermilfoil infestation that greatly interferes with recreational boating and swimming, not to mention adverse impacts on fish, wildlife, and water quality. Animas Geographic Technology selected ArcView desktop software for data processing and editing and cartographic output. Since the field data was collected using ArcPad, the resultant GIS data was returned to the office in a readily compatible format that could immediately be used within ArcView. 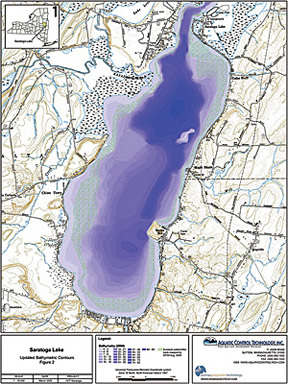 The superior GIS data editing capabilities of ArcView allowed Animas Geographic Technology to quickly create the new bathymetry data that was in turn used to develop volumetric calculations for the areas of invasive weed growth, as well as professional cartographic products. 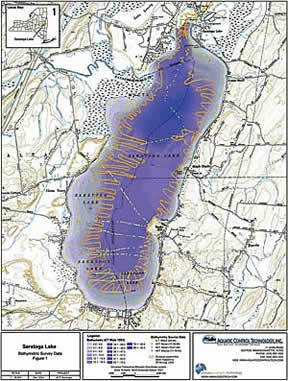 The new bathymetry data was then used to create a new three-dimensional spatial data representation of the lake bed detailing weed-choked areas. Aquatic Control Technology also used the real-time differential GPS capability of the application to navigate this large open water body and precisely apply herbicide to targeted areas for control of the pervasive Eurasian watermilfoil growth in 2007. The Saratoga Lake Protection and Improvement District was extremely pleased with the results of the 2007 program and has committed to an even larger-scale project in 2008. The application that Animas Geographic Technology created has automated much of Aquatic Control Technology's business process in the field and is routinely used for geospatially referenced aquatic plant surveys, as well as for real-time navigation on large treatment projects. Aquatic Control Technology selected Animas Geographic Technology based on its experience using GIS and GPS for data collection and analysis coupled with its custom application development expertise. For more information, contact Joe Finn, commissioner, Saratoga Lake Protection and Improvement District (e-mail: jffinn14@nycap.rr.com, tel. : 518-581-0409); Marc Bellaud, senior biologist, Aquatic Control Technology, Inc. (tel. : 508-865-1000); or Aaron Robinson, president, Animas Geographic Technology, Inc. (e-mail: aaron@animasgeotech.com, tel. : 970-247-0767).